The first step in ensuring your Mountain Laurel Handrail order is precise is with accurate measurements. For new construction, measure from post to post. Your handrail sections will arrive slightly long so they can be cut to fit on site. This ensures a good, tight fit. Mountain Laurel Handrails sections are built so that the finish height is 36″. This height complies with most building code requirement but local regulations may vary so make sure to check with your local code enforcement official if you have any questions or concerns. For an existing home, you’ll also measure from post to post. It’s often possible to save the top rail of an existing guardrail. You’ll need to measure from the deck to the bottom of the top rail so that the handrail sections can fit underneath. Stairs can be built with the stairs inline or on the side of the stringers. If the posts are inline, the lower rail of the handrail will touch the tip of the stair tread. If the posts are to the side, the handrail can attach directly to the stair stringer. This is a great look that obscures the side of the stair. To measure for stairs, you’ll need to check the length from post to post, the height from the bottom of the bottom rail to the top of the top rail and the angle of the stair’s rise. You can use the drawing to measure for your mountain laurel handrail. With these simple steps you’re ready to get started today on your project! 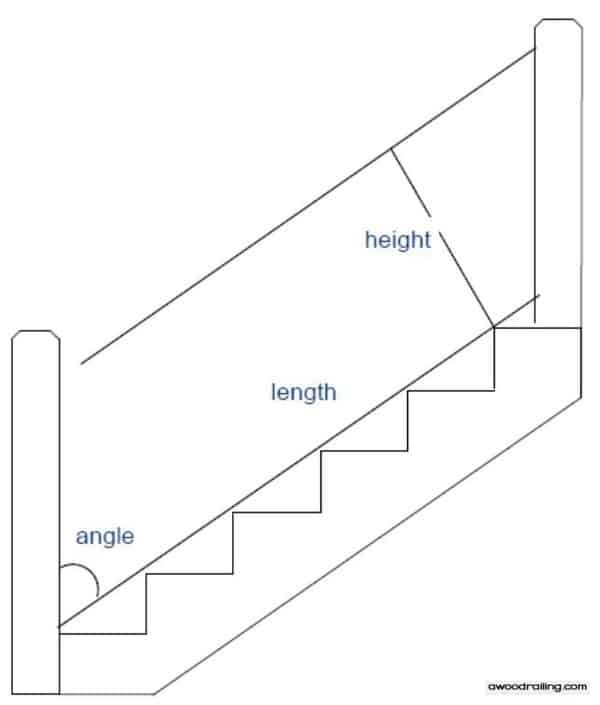 Use this image to measure your stair railing. Mountain Laurel Handrail preassembled sections are built according to your post-to-post measurements and the 2x4s are left one inch long. When the order arrives, rest sections on 2×4 blocks on edge, scribe the ends of the top and bottom rails to match the posts, slide the section into place and fasten with screws. 1×4 are installed with finish nails to sandwich the ends of the sticks at top and bottom. To finish, a 2×6 is installed as a top cap, placing all screws and fasteners to be hidden. Place 2×4 blocks on edge by posts. Place sections on blocks by posts. Mark ends of sections and cut to fit. Screw to post with appropriate size screw. Cut 1x4s (not included) to size. Use finish nail gun to nail 1×4 into fatter diameter sticks. Screw or nail to posts. Cut 2×6 top cap (not included) to length. Use trim head screws and angle upwards through the 2×4 and 1×4 into the bottom of the 2×6 for a fastener free top. Also screw the 2×6 into the posts as possible. These wood railing designs are easy to install! On site, the sections are cut to fit and installed with screws. Lumber is s4s red cedar and is painted or stained to match your color selection prior to assembly. Railing sections are 31″ tall to allow for toe clearance and a 2×6 top rail for a total installed height of 36”. Preassembled sections are only the inner 2x4s with laurel branches attached. The outer 1x4s and 2×6 top rail are assembled on site. 6×6 post is recommended. For 4×4 post, we will use a 1×4 in place of the 2×4 for a finished width of 3″. Preassembled stair railings must be well measured to ensure code compliance. The bottom rail can rest directly on a tread if no more than a 6″ sphere can pass through the opening created and this is a function of the rise and run of the stair. If the post is inline with the stringer, this is the method to choose. It is necessary to know the angle of the stairs and the overall height of the rail from top of top 2×4 to bottom of bottom 2×4. If the desired look is where the branches are attached to the side of the stringer, this can also be achieved with preassembled rail. This is also dependent on the posts being set to the side of the stair stringer. Crucial measurements are again the overall height from top of top to bottom of bottom and the angle of the stair in degrees. This is how the handrail sections look when they arrive at your house. They are ready for installation and only need to be fastened between the posts. This easy to install handrail system is a great way to quickly add mountain charm to your home. The image below is one of the first handrail sections made for this home. Mountain Laurel Handrails arrive pre-assembled, painted and finished so all you have to do is put them in place! It is an easy solution for your home. This next section of railing is designed for use on the slope of the stairs. It is carefully measured and cut to fit your precise measurements. These sections are very easy to install. Below is another section for the slope of the stairs. Notice how the sticks seem to flow with the angle of the handrail. This next picture shows the more common handrail section meant for flat surfaces and not traditionally used on the slope of stairs like the sections in the previous two pictures. Mountain laurel handrails look great in any setting; inside or out. These Mountain Laurel Handrails come easy to install and look great. If you are thinking about adding a rustic look to your home, Mountain Laurel handrails are a perfect fit. Mountain Laurel Handrails can come in all different shapes and sizes and suit just about any home environment. The installation can easily be completed in no time at all. Handrails are made to the exact measurements that the consumer gives to me. We make sure that there is a little excess so that the installer can trim them down if needed. This next handrail is a prime example of the ‘Sunburst’ design that is perfect for the centerpiece of any handrail design. This is just one of many custom designs that make Mountain Laurel handrails a perfect fit for your home. Each section of Mountain Laurel handrails are unique in every way. These handrails add a stylish flare to any type of home. How Are Branch Railings Built? Mountain Laurel Handrails are the perfect complement to any county home, whether in the city or the mountains. Reusing wood is a green alternative to burning it as waste. 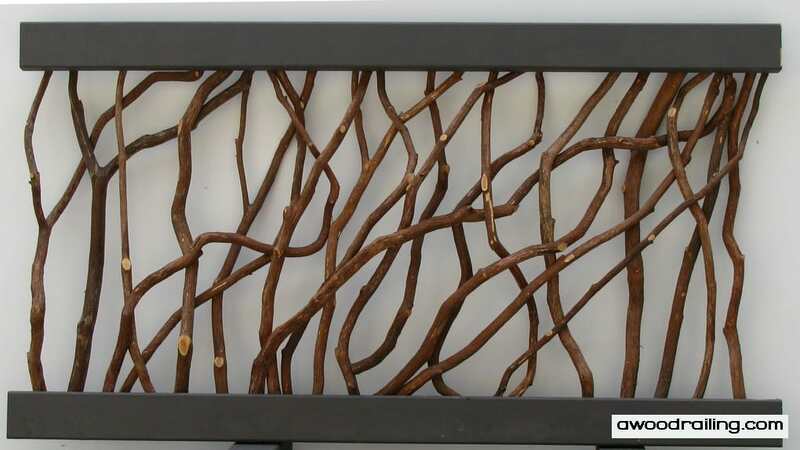 Skilled craftsmen can assemble mountain laurel and rhododendron branches into items of beauty that impart the look and feel of the forest to your home. Read on to learn how you can make your own. Measure the handrail location from post to post. You will need two 2x4s, two 1x4s and one 2×6 for each handrail section. Make a list of all the lumber you will need. Paint or stain the dimensional lumber prior to assembly. Secure two 2x4s to a surface making sure that they are 31 inches apart from top to bottom. For a total handrail height of 36 inches, handrails should be installed 3.5 inches above the floor. Cut a piece of mountain laurel to fit. Nail it to the top and bottom 2x4s with a 16-gauge finish nail gun. The section of railing is ready to be installed! 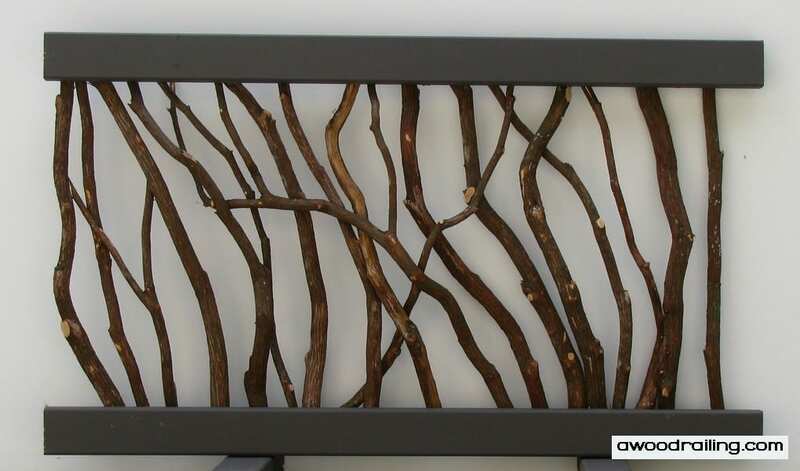 This is a simple way to add natural beauty to your home decor. Mountain Laurel Handrails are great for interior applications as well as on exterior decks. Please remember to be careful when using power tools and nail guns.